That is one amazing card!!!! wow!! Thanks for all the info to a beginner water colorist I need all the help I can get. Love the card! Thanks for a mini water color thanks for a mini water color class. Lovely. i always appreciate your informative posts! thanks! Should I just hand over my Visa card to Hero Arts, too? hahahaha! Beautifully coloured flowers, the work of an artist. Thanks for the video and tips. Such an informative video and stunning finished piece. Really compliments the Hero Arts kit. So gorgeous! Love the colors, super rich looking! 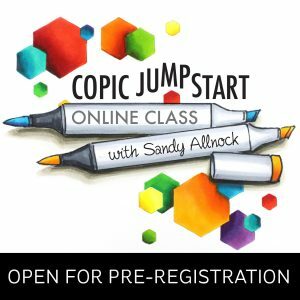 Can’t wait for the Copics class but glad you delayed it, works better for this farm-wife who has to help put the crop in in May! Lovely card…gorgeous watercoloring!! Thanks for sharing your fabulous art!! Your card is lovely! I love your color choices. Thanks so much for the video tutorial! Very pretty card..Thanks for the video!! thanks for the video, beautiful work! Gorgeous! Love your color combo! Love your card and video. Thank you for putting it out. Wow! Beautful card and a video too!!! 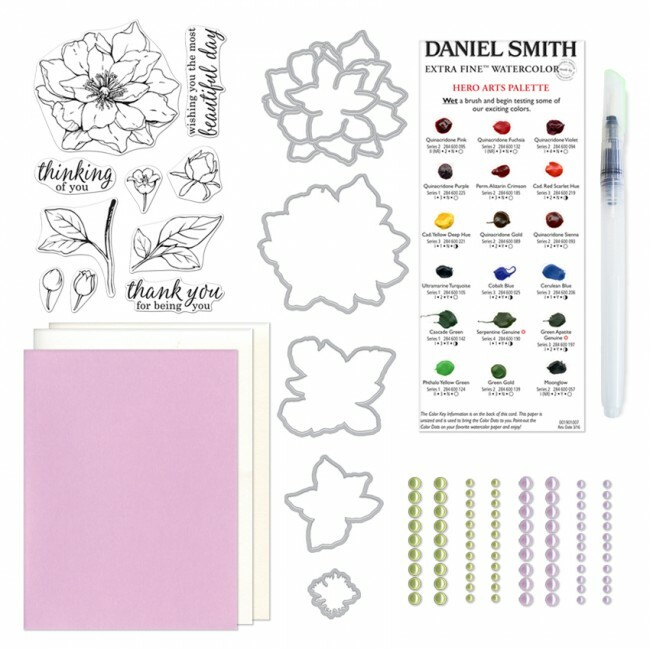 Thanks for all the info and for hosting this giveway! Very instructive video. The dot card idea make for a very portable project. Thanks for hosting the giveaway. The flowers look great! For me, they have something of a vintage feel. Am I crazy or is there whistling in the background? Sandy, Thank you. I love how your watercolor expertise made the gorgeous Hero flowers pop. You never disappoint me. Would never have thought to tuck the flowers behind the sentiment as you did. Love it! Also like the envelope box. Absolutely gorgeous. Love the watercoloring. fun kit. Good way to try a new technique. You are so talented. This card makes me smile…love your color choices. I am glad you took that phone call…the leaves and greens are fantastic! SO GORGEOUS ..great color combo too…and video! WOW! This is so so so beautiful. Beautiful card – really enjoyed your video! Sooo very tempting to get this kit! Love the paints!! My goodness! You know I greatly admire your watercolor skills (well ALL your artistic talents, really). This card just deepens that admiration. Beautiful card Sandy! As always thank you for the tips!! 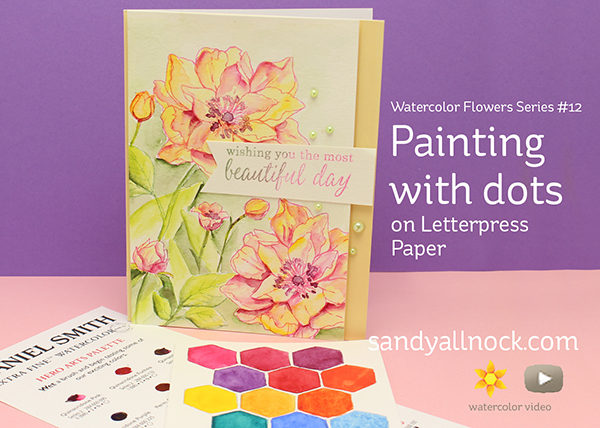 Thanks for the terrific video that shows how to watercolor a beautiful card-especially since flowers can be difficult! You can get carried away again soon. I really like the color combo for this card and when I order this kit I can channel my inner Sandy. 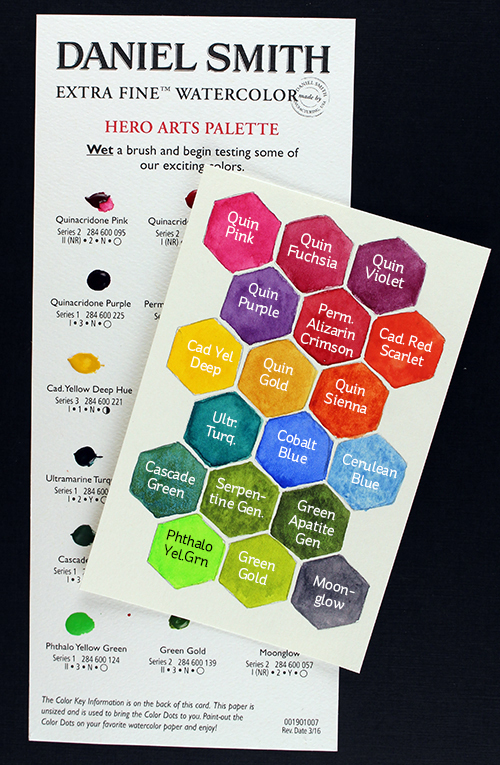 I’ve been dreaming about trying these watercolors ever since you started using them on your blog. Thank. This is a stunning example of your creative genius. Thank you. Your watercolouring is amazing. Love this kit. Stunning painting! Just a work of art! Terrific Sandy! Love all your amazing creations and this one is so inspiring! Thanks for sharing your talent how to do with beautiful tips! Haha I love number 6 in the supplies list. Whoever said watching paint dry is boring has never seen your artwork, you are amazing. Thank you for the hours of talent you share with us. Gorgeous card as usual! I love your work and your fabulous videos! You had me laughing out loud about your phone call!!! Love watching your videos. I have learnt so much. Loved the colure on this flower. Your flowers are beautiful! I will come back to watch the video; I know you will have a lot of tips for me. It is perfect. Thanks for sharing your beautiful card and all your experience. Sandy Your card is absolutely gorgeous! I love your color pallet and your artistic talents are phenomenal God blesses each of us as we watch you create.